This 40-mile tour abounds with summertime outdoor recreational opportunities, including alpine hikes and chairlift rides, not to mention high-spirited festivals. This year marks the 75th anniversary of Red River’s 4th of July Parade, and the rollicking music fest Hot Chili Days, Cool Mountain Nights—a celebration of Texas-driven “red-dirt rock” and down-home chili and chile cookoffs—takes place August 12–15. redriver.org/hotchilidays. Start in Cimarrón, reached most easily from I-25 (exit 419 to NM 58 from the south, or exit 446 to US 64 from the north). Explore the town and overnight at the legendary St. James Hotel. In the morning, continue west on US 64 for 24 miles to Eagle Nest for brunch—stopping en route for a hike in Cimarrón Canyon State Park. Leave town by heading north via NM 38, part of the famed Enchanted Circle Scenic Byway, detouring briefly to sample terrific craft beers at Comanche Creek Brewing, and continue 18 miles to Red River. The following day, leave town by continuing west 12 miles to Questa and then south 25 miles on NM 522 toward Taos. You can easily add a few side adventures to this picturesque circuit, such as exploring Wild Rivers Recreation Area, near Questa, or visiting the colorful galleries, boutiques, and cafés in Arroyo Seco. 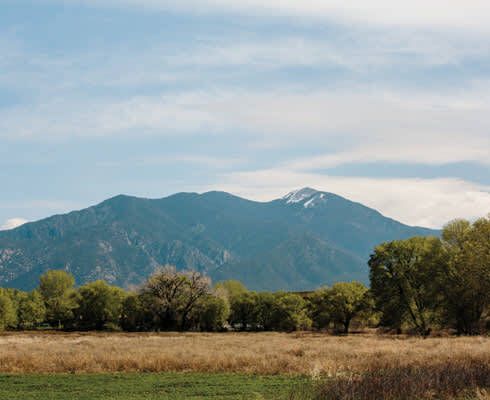 Spend the afternoon strolling around Cimarrón, set in the eastern foothills of the Sangre de Cristo range. In New Town (which was established in the early 1900s), several galleries line East 9th Street. Standouts include Susan Norris Artworks, which carries the proprietor’s vivid oil paintings, ink drawings, and bronze and mixed-media sculptures—many depicting horses, birds, and African fauna—and Cimarrón Art Gallery, which specializes in wildlife-themed jewelry and crafts. Treat yourself to a dish of ice cream from the gallery’s old-fashioned soda fountain—it dates to the building’s origins as a drugstore in the 1930s. On East 10th Street, have a look at Santa Fe National Historic Trail, where interpretive plaques provide detailed biographies of Kit Carson, Lew Wallace, and other Western luminaries, and relate the story of Cimarrón’s pivotal role as a stop on the trail that opened trade between New Mexico and the rest of the country. It’s a short drive or 10-minute walk south to Old Town, established in the 1850s. Be sure to stop by Old Aztec Mill Museum, built by cattle baron Lucien B. Maxwell in 1864. Inside this towering, steep-roofed building, three stories and a basement packed with photographs, old maps, dioramas, and memorabilia bring Cimarrón’s history to life. End your stroll at one of the West’s most storied old-time hotels, the St. James, an imposing two-story edifice with an ornate cornice molding. It’s an unexpected sight in tiny Cimarrón. Investigate this landmark hotel’s lobby and ground-floor hallway, which contain a gallery of photos and documents from Cimarrón’s early-20th-century railroad era. The hotel was founded by Henri Lambert, a former personal chef to Presidents Lincoln and Grant who came west in 1872 to cook for Maxwell. You can also peek inside certain guest rooms, some named for past occupants of note, such as Doc Holliday, Annie Oakley, and Bat Masterson. Placards reveal some of the less savory goings-on during the hotel’s early years— for example, that an unfortunate soul named Frank Shook perished in Room 6, “shot three times in the belly by Prairie Dog Payne.” In the colorful restaurant and saloon, where musicians perform many evenings, sup on classic New Mexican and American fare including grilled rainbow trout and tender rib-eye steaks. Save room for a piece of fresh-baked pie. Spend the night in the venerable St. James, along with the alleged ghostly inhabitants. (Although guests are encouraged to watch for otherworldly spirits, Ouija boards and lighted candles are forbidden.) If creaky floorboards, antique beds with frilly linens, and period antiques aren’t your thing, book one of the more up-to-date rooms in the newer adjacent wing. 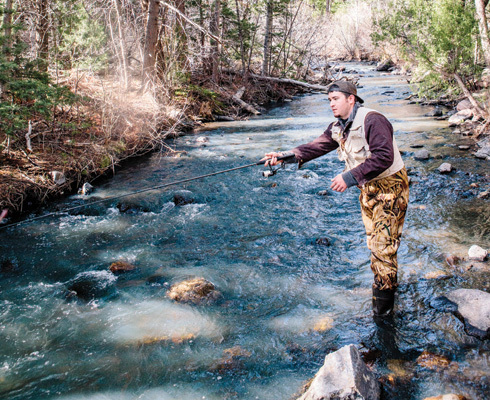 Jared Kruse of Albuquerque fly-fishing for trout on the Cimarrón River. In the morning, head toward Eagle Nest, stopping en route in Cimarrón Canyon State Park for a morning ramble. The four-mile-round-trip Jasper-Agate Trail, at mile marker 293 on US 64, is a stunner, passing through a radiant pine forest and offering dazzling views of Palisades Sill, a sheer wall of granite cliffs that rises some 1,000 feet above the Cimarrón River. For lunch, continue to the in Eagle Nest. Portions are huge in this cozy café, decorated with vintage cameras and posters of old movies and 1930s baseball cards. 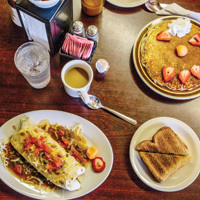 Particularly impressive is the breakfast burrito (about the size of a brick)—order it smothered in green chile sauce. Suds at Comanche Creek Brewing. Breakfast at the D&D Cafe in Eagle Nest. 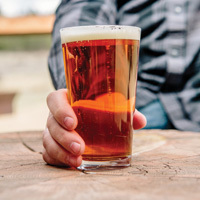 Small craft breweries thrive throughout New Mexico these days, but few are as endearingly laid-back and homegrown as Comanche Creek Brewing Company, which you reach down bumpy, unpaved Comanche Creek Road, off NM 38. Inside this tin-roofed log cabin, have a seat on the covered deck and sample whatever fresh brews—Deadman Pale Ale, Gold Rush Kölsch—young owners Kody and Tasha Mutz are pouring that day. Arrive at Red River Ski Area by midafternoon, in time to ride the Platinum chairlift, a 1,600-foot ascent to the mountain’s upper reaches. At the top, savor burgers and brats at the Ski Tip Restaurant, which offers panoramic bird’s-eye views and live music on Saturdays. You can hike, or mountain-bike back down to base camp, where thrill-seekers may wish to continue their adventures by riding the new Pioneer Flyer seated zipline. Sundance Restaurant turns out some of the best dinners in this rugged, meat-loving town, popular with vacationing Texans and Oklahomans. Head to this lively, timber-frame roadhouse for delicious grilled pork tenderloin smothered with honey-chipotle sauce, carne adovada burritos, or a New York strip steak. Red River is home to a surprisingly robust Tex–New Mex music scene, which flourishes in summer (see “Nine Nights a Week” from last August, mynm.us/9nights_keller). Catch Michael Martin Murphey’s Rocking 3M Chuckwagon Stage Show, which includes dinner, on Fourth of July weekend as well as on Thursdays and Saturdays (and some bonus dates) through the rest of the summer. The dining, entertainment, and hospitality compound Texas Reds/Lodge at Red River/ Motherlode Saloon/Lost Love Saloon is in the heart of town. Keep an ear out for Mike Addington, who handles a yeoman’s share of the musical entertainment in the saloons. There are several reasonably priced hotels near the base of Red River Ski Area, including the Best Western River’s Edge and Copper King Lodge. At either one, you can soak in a hot tub overlooking the river. The Copper King is a great choice for families, as many units have kitchens, sitting areas, and additional bedrooms. The Little Red Schoolhouse Museum, in Red River. The following morning, stroll along Red River’s broad Main Street, checking out the several galleries and shops, many specializing in rustic goods inspired by the surrounding mountain forests, from antler chandeliers to chainsaw-carved wooden cowboys. 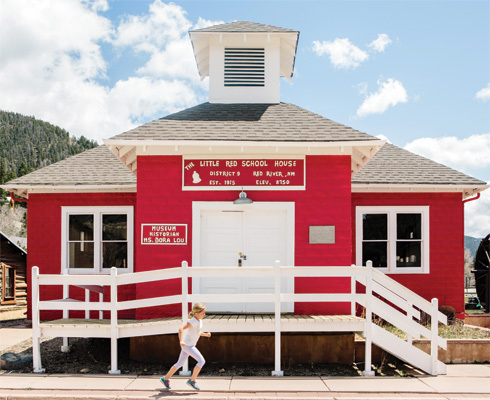 Stop inside the brightly painted Little Red Schoolhouse Museum, which dates to 1915. Exhibits impart the town’s origins as a mining boomtown and its 1960 transformation into an acclaimed recreation center. 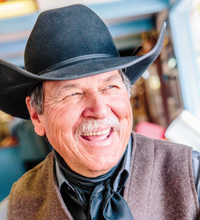 Before following the Enchanted Circle around toward Taos, drop by Shotgun Willie’s, a hole-in-the-wall barbecue joint and diner, to fill up on biscuits and gravy, Frito pie, catfish with hush puppies, or—the house specialty—chopped brisket with tangy barbecue sauce. A satisfied customer at Shotgun Willie’s, in Red River.